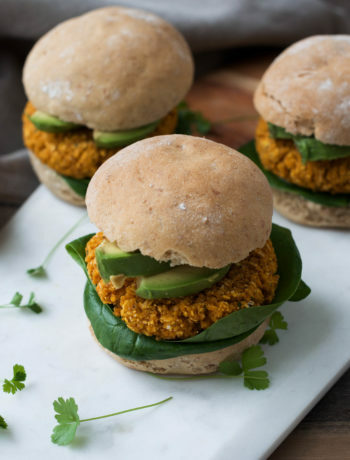 Filled with vegetables and packed with plantbased protein, these Veggie Cakes with a Sweet Potato Dip make the perfect appetizer for a party or a delicious side dish with a big salad ! The recipe for these Veggie Cakes with a Sweet Potato Dip was created quite randomly if I’m being honest. One day, I had a few leftover steamed veggies and I wanted to use them up. I thought it would be nice to change it up a bit and, instead of eating them plain or in a stir-fry, turn them into some sort of fritter. I had chickpea flour in my pantry, which is a great binder when combined with water. No need for anything else to replace eggs ! In a matter of 15 minutes or so, I had my cakes ready, and decided to make a sweet potato dip to go along with it (yes, my fridge was full of leftover vegetables). In this recipe, I included the time needed to prep, steam/boil the veggies, but if you have leftovers just use them instead ! It’s a great recipe to clean out your fridge. 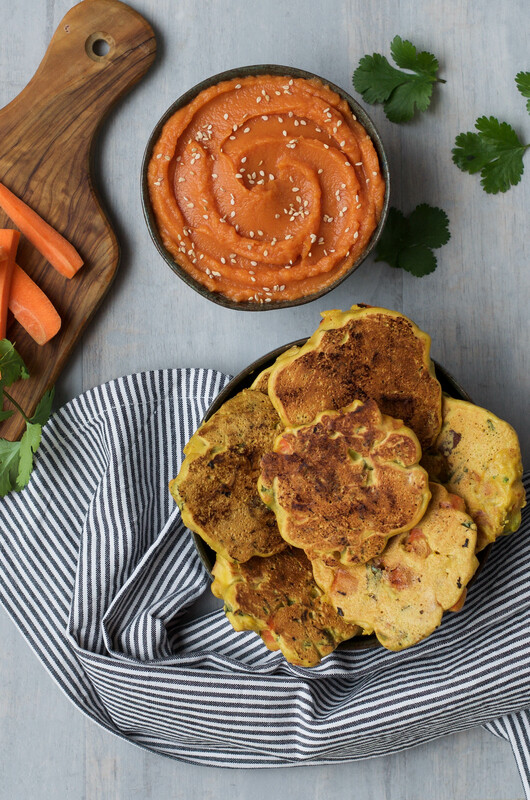 These Veggie Cakes are filled with carrots, broccoli, cilantro and smoked tofu. When I first made them though, I used steamed brussel sprouts instead of broccoli, and it was delicious as well. So definitely go ahead and try any variations you want with the veggies ! Just follow my ratios so the consistency of the batter remains the same. 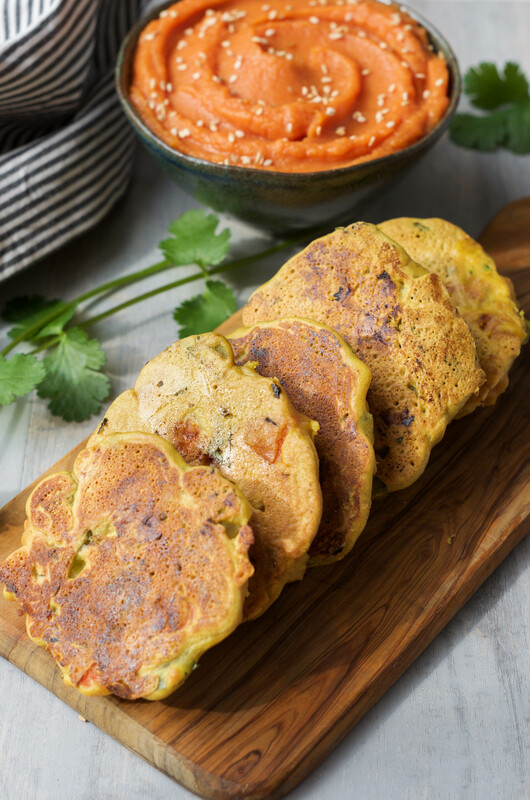 Filled with vegetables, these Veggie Cakes are also packed with protein, thanks to the chickpea flour and the tofu. 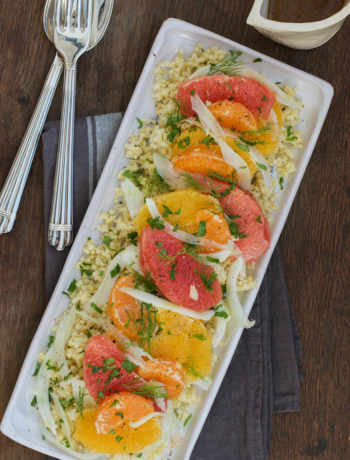 Pair this dish with a big salad, and you have a complete healthy meal ! The spices are key in this recipe, because they add so much flavor and depth to the cakes. The chickpea flour alone just wouldn’t do it, so don’t forget the spices ! 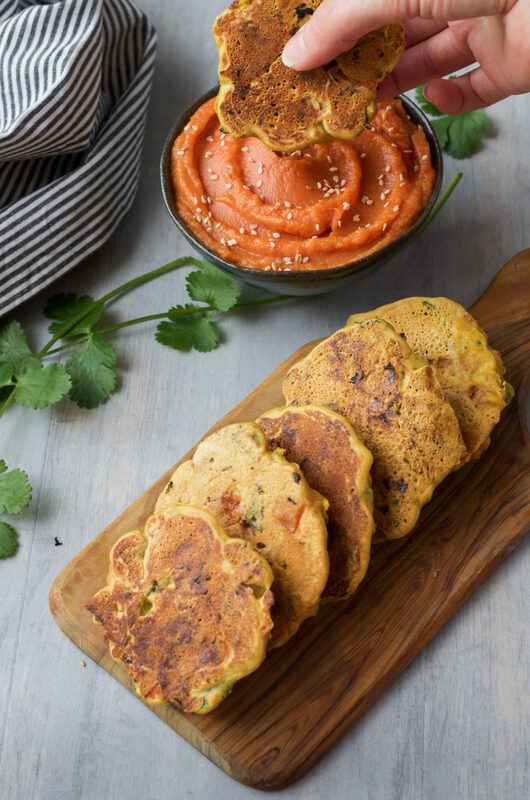 Another amazing flavor enhancer used in these Veggie Cakes is cilantro. If you just can’t stand cilantro (-Why oh why ?-), just omit it or replace it with parsley. As for the dip, the sweet potatoes add such a nice sweetness to the dish, it just goes perfectly with the cakes and the spices. They also have the perfect texture for a dip. 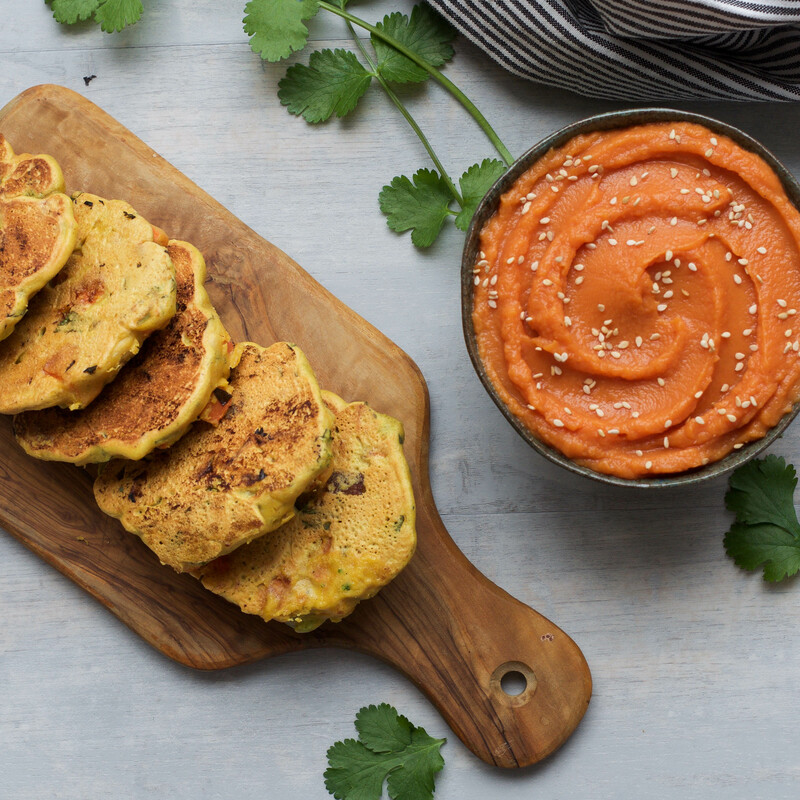 While these veggie cakes with a sweet potato dip make an amazing side dish, you could also make them a bit smaller and bring them to a party ! Easy to transport and to eat, they would make the perfect appetizer. The cakes taste better warm, it’s better to reheat them if not enjoying right away. However, you could serve the dip warm or not, it is delicious either way. Don’t be afraid to swap the veggies for ones you already have leftovers of, just follow the ratios ! Start by steaming the sweet potatoes until tender. Set aside, we will use them for the dip. In the meantime, blanch the broccoli. Set aside. Add a few tablespooons of water to a frying pan and sauté the carrots, covered, on low-medium heat for 8 minutes. Add the 2 tbsp of chopped cilantro and sauté for 2 more minutes, uncovered. In the meantime, chop the broccoli in tiny pieces. Then, in a large bowl, mix together the dry ingredients for the cakes: chickpea flour, cumin, turmeric, smoked paprika, chili powder, salt and pepper. Pour in the water and mix well so everything is combined. Fold in the broccoli, carrots, tofu, and the remaining 2 tbsp of chopped cilantro. Heat a large frying pan with a little bit of oil, on medium-high heat. When it's hot, spoon about 1/4 cup of the batter at a time and pour it in the pan, to form the cakes. Cook them for 5 to 6 minutes and flip them (they should be golden brown on the bottom, and easy to flip). Cook the other side for another 3 to 4 minutes, until both sides are golden brown and cooked through. In the meantime, prepare the dip by adding the steamed sweet potatoes, miso paste, tomato paste, sriracha, water, garlic powder and pepper to a mixing bowl. 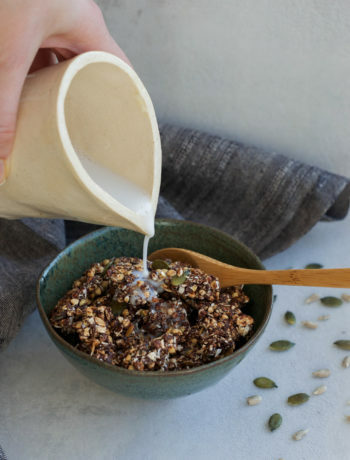 Blend everything until smooth with an immersion blender or use a regular blender. Serve the cakes warm with the sweet potato dip. If you don't like cilantro, feel free to use parsley instead, or omit it. If you can, use 2 frying pans to cook all the cakes, it will be much faster! You can serve the dip either cold or warm, as you prefer.